Since the beginning of recorded history, not only has humankind maintained a deep fascination with this “precious” metal, it has also sought ways to tinker with it. Chemistry, the modern science of atoms, molecules and matter, evolved out of alchemy, the most famous goal of which was transmutation – attempting to turn base metals such as lead into silver and gold. In the interests of aesthetics and forays into hitherto uncharted areas of fashion, pure gold has been mixed with other less-precious metals to produce all different colors of gold. Today these colors, called gold alloys, include white, brown, pink, purple, red, green, blue and even black gold, all of which have been used to make different colored gold jewelry. They can be anything from 10 karat to 18 karat gold, and changing the composition percentage of gold and the metal it’s mixed with produces different shades and hues of each color. Gold, in its purest state, is a soft and malleable material with a warm yellow color. All gold jewelry is in actuality an alloy (24 karat gold is too soft to make jewelry from, and gold jewelry of any karat weight – 14, 18, 22 – is pure gold mixed with other metals). Mixing gold with nickel, zinc or palladium makes white gold, which can be in 18 karat or 14 karat gold. Nickel mixed with gold produces a white or grey color, and, although palladium is a good option for those who have an allergy to nickel, it is more expensive (around $370 per ounce). This is probably the most popular gold alloy and is useful for people who want something non-yellow and more precious than silver, but who aren’t able to afford the skyrocketing price of platinum (now hovering around $1,800 per ounce). White gold has some drawbacks, however – in most cases, it is not truly white, but ends up with a slight yellowish tint; furthermore the white plating may eventually begin to wear, meaning higher maintenance costs over time. Rose or pink gold is produced by mixing copper with yellow gold. Despite the assertion of some in the industry that rose gold wouldn’t take off in the U.S. because American women “do not understand it,” rose gold is slowly but surely finding its niche in the American market, as the number of designs incorporating it increases. The more copper added to the mix, the deeper the rose color will be. Rose gold can include anything from a light pink hue to a much richer, almost red color. Gold with a slight green glow is produced from a mix of silver and gold (leaving copper out of the mix), and actually appears more greenish-yellow than its name would suggest. Amethyst, or violet gold, are names used to refer to a gold alloy with a purplish hue, which is created from a combination of gold and aluminum, while mixing gold with indium (a chemical element with similar properties to aluminum and zinc), gives gold a bluish color. Both brown and black gold are created by a number of chemical techniques, including electro-deposition, controlled oxidation or a plasma assisted chemical vapor deposition process. The different colors of gold may say more about the wearer than what’s on the surface. Those who opt for yellow gold may be seeking to convey messages of tradition and wealth (as well as warmth, purity, eternity and intensity). White gold, by contrast, may be used to communicate a more modern and simple, and even youthful message. White gold has been particularly popular in the bridal industry, promoted by many who say that white metal reflects the brilliance of diamonds better than other colors. However, white gold’s status as a modern metal for the modern man or woman could be changing, as more alternatively colored gold begin to symbolize what’s hot and new. But gold in general has not served as a particular symbol of innovation or cutting-edge design. On the contrary, gold has always been associated with wealth, as a currency standard, with royalty, and with jewelry made from alternative metals such as palladium and titanium coming on the scene, gold has come to be a sign of tradition and familiarity. Just as high-tech buffs are always on the lookout for the next great gadget, fashionistas may be looking to colored gold to satisfy their craving for something cutting edge. “Colored golds offer a unique and beautiful product to meet this demand for novelty while maintaining a sense of stature and lasting beauty,” says O’Steen. A popular shade being touted recently as a resurrected shade and even as “a new black” is brown or chocolate gold. Jewelry in brown gold permeated last year’s Basel and JCK shows, and jewelers continue to reinvent this color into new designs. Some of the most prominent to “resurrect” this earth tone have been Roberto Coin, with brown gold designs, and Mattioli’s rich chocolate gold pieces. Daniel Bogue, director of Mattioli USA, explains that for the last six years or so, the general direction of fashion has been toward things white – including white gold – white-intensive, and very “diamondy.” But in the last two years, the emphasis has most definitely shifted. One of the products of this shift has been Mattioli’s brown gold, which was released in early 2007 in the form of the Cacao line – a collection of bracelets and necklaces characterized by big, open-links. Mattioli couples brown or champagne diamonds with the brown gold, and, as Bogue explains, one of the most interesting features of brown gold is its versatility – it can be paired with other colors of gold (yellow, white, black) and worn with a number of fashions. According to Bogue, brown gold was Mattioli’s answer to a need in the market for something new and novel – something that hadn’t been done before. It targets a very specific segment of the market – a fashion-forward, modern woman who wants to have the latest and greatest in the world of wearable art, a connoisseur, in a way. 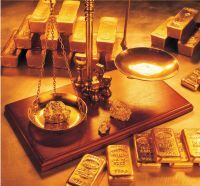 The firm has found strong interest in its colored gold. Rose gold, as well, has been a growing trend for the last few seasons, notes O’Steen. As fashion designers continue to embrace feminine styles, fabrics and colors, they are increasingly utilizing the feminine allure of rose gold, which, incidentally also looks good on almost every skin tone, enhancing its salability. In 2003, H.Stern released a brand new color “Noble Gold” – a flesh-colored metal that H.Stern’s design team spent years working to perfect. The goal was to create a new color of gold that would go well with any skin tone. According to Courtney Stursberg, coordinator of H.Stern’s Celebrity and Public Relations, it doesn’t matter whether your skin tone is fair, olive, tan or dark, Noble gold will look good on it. Most of the company’s Noble gold is sold through its Cobblestone and Star collections. Stursberg says the response from the general public has been “huge,” with customers specifically requesting pieces in Noble gold over and over again. On the luxury end, the more alternative and cutting edge colors of blue, chocolate and black gold are making noteworthy and fashionable forays. Conversely, at the mass market level , more standard selections of yellow and white gold, or two-tone pieces incorporating both white and yellow together, are maintaining their prominence – given their high degree of flexibility in a jewelry wardrobe. There are also cultural considerations to take into account regarding different colors of gold. In some parts of the world, white gold carries strong associations with diamonds, prized for their brilliance and glamour, while in others, (China and India, for example), white gold is often confused with platinum, a much more expensive white-gray colored precious metal, which may or may not add to its popularity. For holidays, romantic or feminine undertones of rose or pink gold may appeal to some for Valentine’s Day, the holiday of red hearts and love. Additional colors, including purple, green or peach gold may resonate with those looking to make a statement of individuality. Yellow and white gold still make up the majority of gold purchased in the United States and Europe. But when it comes down to it, colored gold is slowly but surely being established as a material with which fashion-conscious consumers can find something new and unique, past the traditional yellow gold into the innovation and cutting-edge personality of blue, green, purple, brown and black gold.